We’d love your help. Let us know what’s wrong with this preview of Women Waking Up by P.D.R. Lindsay. 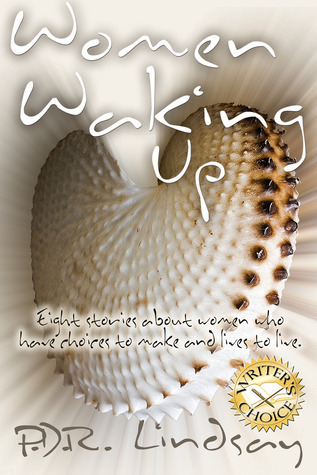 Women Waking Up is an anthology of eight stories about eight different women. Facing their problems with humour, courage, or cheerful ignorance, cunning, guile or sheer women's cheek, these eight women find ways to make changes in their lives. They have a chance to make a choice, or make a decision, which might affect them in a major way. Most of these stories were first pu Women Waking Up is an anthology of eight stories about eight different women. Facing their problems with humour, courage, or cheerful ignorance, cunning, guile or sheer women's cheek, these eight women find ways to make changes in their lives. They have a chance to make a choice, or make a decision, which might affect them in a major way. To ask other readers questions about Women Waking Up, please sign up. Oh gosh this just made me cry. What can I say? I found the first story, 'Paper Nautilus' intensely moving, evocative and beautifully written. Short stories anthologies always need to work harder to get high star ratings. In hindsight I should have given this a 4. I waited to see which stories would 'dwell' and found that there were a few. When I think of these stories I remember New Zealand although, I guess, they could take place anywhere in the world. - the husband who sides with his moth Short stories anthologies always need to work harder to get high star ratings.